Hamburg — The spa in the world’s highest hotel, the Ritz-Carlton in Hong Kong, has been selected by Emporis’ architecture experts as having the best view in the world. 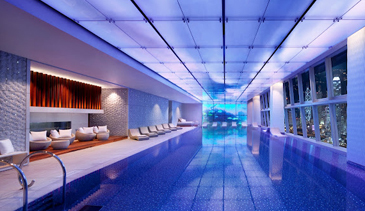 Located in the 465 meter tall International Commerce Centre, the spa, with its luxurious 860 m² interior and indoor swimming pool, emerged the winner, offering a panoramic view over Victoria Harbour from 116 floors above the ground. The Emporis jury chose the Top 10 from over 400 spas in urban metropolises around the world. The jury rated factors such as the spa’s height and view as well as the location’s architectural features and interior design. Asian cities dominate the Top 10. Their skylines offer breathtaking views for which Asia is celebrated. Runner-up “Banyan Tree Spa” of the 207-meter tall Marina Bay Sands Hotel in Singapore attracts visitors with its “Infinity Pool”; swimming is an adventure when the surrounding skyscrapers seem so close. The Traders Hotel’s spa in Kuala Lumpur offers a visual tribute to the twin Petronas Towers, which until 2004 were the highest buildings in the world. All the nominated spas are located in bustling cities where escapism is particularly necessary. Located like bird’s nests at the top of the tallest buildings, they offer both physical and visual distance from the hustle and bustle. In third place, “Spa at Mandarin Oriental” is located on the 37th and 38th stories of the Nihonbashi Mitsui Tower with dizzying sights over Tokyo’s financial district. In the last decade, increasing numbers of luxury hotel spas have opened in spectacular heights to offer visitors a both contemporary and holistic oasis in city centers. Most of the spas in the ranking are less than 10 years old: the “Ritz-Carlton Spa by ESPA” and the “Banyan Tree Spa”, for instance, both opened in 2011. The Gansevoort Meatpacking NYC spa was established in 2004. “The latest trend in the tourism industry allows travellers to unwind and to enjoy an incredible view of the city; relaxation and sightseeing are perfectly combined,” commented Matthew Keutenius, architecture expert at Emporis. Emporis is a leading database, based in Germany, which provides global building information universally accessible to users. For over a decade they have helped companies, organizations and individuals stay informed about the building industry.